When I heard about a new line of trading cards Upper Deck was sending out to collectors this week, I was immediately interested. As a huge fan of horse racing, it’s a little tough as there’s not that much for us die-hards to collect and unfortunately horse racing does not do a lot to promote its own stars. Something about the gates flying open, these majestic animals kicking up dirt as they pass the grandstand, the excitement of the stretch run, and every so often, cheering your horse to victory is just a lot of fun. The roller coaster of emotions you feel in a matter of minutes while watching horse racing, especially in person, is something I haven’t felt in any other sport. 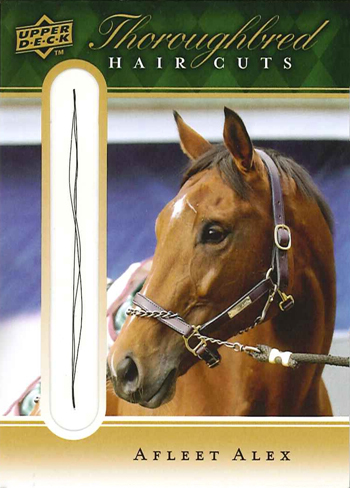 That’s why I was so happy to see Upper Deck push the envelope on sports trading cards by introducing a revolutionary three-card set of thoroughbred cards (with strands of hair from the horses’ actual manes) that are sure to catch the interest of a wide array of collectors. The cards should prove popular with speculators looking for a pure investment after seeing the success of Upper Deck’s 2009 MLB Goodwin Champions set in which they were included, to horse-racing fanatics who have fond memories of each horse. Funny Cide (Distorted Humor-Belle’s Good Cide) won the Kentucky Derby in 2003, posting an incredibly fast time of 2:01.19, the 10th fastest Derby run on record. He became the first gelding to win the race since 1929, and beat the well regarded Empire Maker, among others, in the process. His trainer, Barclay Tagg, joined an elite group in winning his initial attempt at the Kentucky Derby. In the Preakness, the reddish chestnut freaked again, this time romping home by a stunning nine-and-three-quarter lengths. Unfortunately, Empire Maker ruined Funny Cide’s Triple Crown quest by defeating him three weeks later in the Belmont Stakes in New York. It was ironic that Funny Cide’s loss occurred in New York, as he was the first New York-bred horse to win the Kentucky Derby. Funny Cide was an immensely popular horse, and his ownership group, Sackatoba Stables, was a collection of lifelong friends who each chipped in a modest amount of money and bought a ticket to a lifetime of memories. Funny Cide is retired and living at the Kentucky Horse Park in Lexington, Kentucky, where his legions of fans can visit him throughout the year. 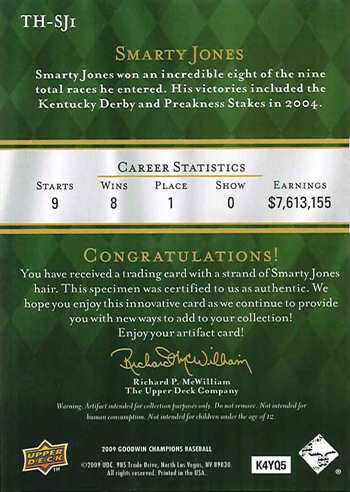 Smarty Jones (Elusive Quality- I’ll Get Along) was arguably the most talented of the trio honored by Upper Deck’s initial foray into horse-racing collectibles. Smarty would overcome early adversity on his way to greatness, as he had a training accident in the starting gate that almost cost him his left eye. Smarty won his first two starts by a combined 22 lengths, at which point his connections realized they were in the presence of true greatness. After Smarty’s team campaigned the horse in the midwest for his three-year-old season, Smarty swept the Rebel Stakes and the Arkansas Derby on his way to the starting gate at Churchill Downs in Kentucky. He was then eligible for a $5 million bonus if he were to win the Kentucky Derby and sweep all three races. Smarty did not let his connections down, as he romped in the 2004 Derby by two-and-three-quarter lengths, becoming the first undefeated Kentucky Derby winner since Seattle Slew in 1977. Smarty was now America’s darling, and he appeared on the cover of Sports Illustrated after his gaudy win in the Derby. In the Preakness two short weeks later, Smarty Jones toyed with his opponents, winning by a record 11.5 lengths with breathtaking ease. Three weeks later, at the Belmont Stakes, Smarty Jones lost a heartbreaking decision to Birdstone, a long shot, relinquishing the lead late in the stretch to finish second, the only defeat in his brief but brilliant career. He would never race again, but his legend lives on to this day. There are many horse-racing devotees who argue that Smarty Jones was one of the fastest horses in the sport over the past 20-to-30 years. He stands stud at Three Chimneys Farm in Midway, Kentucky, and his early progeny show much promise as potential stars in their own right. There was some controversy in that many in the sport were upset with the ownership group for retiring Smarty Jones without letting him run as a four-year-old, but the stakes were deemed too high risk to allow him to continue. Afleet Alex (Northern Afleet-Maggy Hawk), like Smarty Jones before him, overcame a troubled childhood to blossom into one of America’s most exciting thoroughbreds in the past 10 years. Alex’s mother would not nurse, depriving the horse of key nutrients until a nurse mare could be brought to him 12 days later. Afleet Alex’s racing career commenced in style, as he scored impressive wins as a two-year-old, and was among the favorites heading to the Kentucky Derby in 2005. Unfortunately, Afleet Alex would finish third, beaten by only one length by longshot Giacomo, in the 2005 Kentucky Derby. Later, Jeremy Rose, the jockey, would concede that he hadn’t given Alex the best ride in the Derby. His task was made even tougher with Spanish Chestnut, a speedball who set impossible fractions, entered, as he compromised Alex’s chances a bit from a strategic standpoint. But Alex’s moment to shine came in the Preakness, in one of the most dramatic events in any Triple Crown season. Afleet Alex came to the top of the stretch in the Preakness Stakes trailing only one horse, longshot Scrappy T. But Scrappy T’s jockey, Ramon Dominguez, hit the horse with his whip at the top of the stretch, and the horse veered out directly in the path of Afleet Alex, who was gaining quickly on the leader. As a result of Scrappy T’s abrupt and sudden change in direction, Afleet Alex clipped heels with Scrappy T and almost fell to the track. Jeremy Rose somehow managed to stay aboard Alex, despite flying up the neck of the horse, and both horse and jockey quickly rejoined the race where Afleet Alex triumphed bravely by four-and-three-quarter lengths. Despite all the trouble, the final time was very quick, and established Afleet Alex as a dominant horse of his generation. Three weeks later, in the Belmont Stakes, Alex would obliterate the opposition, blasting past Giacomo to win by seven lengths. His greatness confirmed, Alex would go on to be retired later that year due to an injury, and now stands stud at Gainesway Farm in Lexington, Kentucky. Kevin Carlin is an avid sports fan, especially with regard to horse-racing and boxing. He is a freelance writer in addition to his full-time job selling group health insurance to small and mid-size companies at Houska Insurance Services in El Segundo, CA. WOW that is really great. Would love to see Man O War up there too! 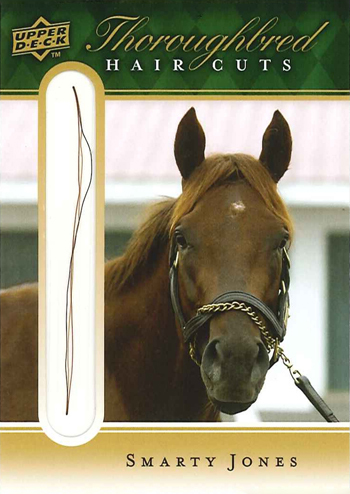 Do you really think any of Man O War’s hair still exists. He’s only been dead about 7 decades. Where is the Curlin card? He did afterall break the all time money earned record while winning the BC Classic, Jockey Club Gold Cup, Preakness Stakes, etc. This sport needs to quit only marketing the Triple Crown stars unless it wants to become completely irrelavant the other 10 months out of the year. This would be a great tool to let people know that there is more to racing then the First Saturday in May until 5 weeks later. I agree Paul — Where is Cigar? Z E N Y A T T A ?? All of these champions are still alive and would make even better “champions” for trading cards. 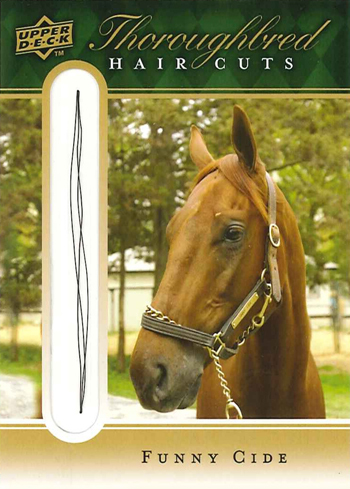 Curlin definitely should have a trading card. Heck, he even won a TC race, the Preakness. I agree. It would be great to see Curlin, Zenyatta, Rachel Alexandra, etc. Any history makers. It would definitely promote the sport and teach as well. Hi Kevin Carlin, just wanted to say, I loved this article. It was funny. Keep on posting!